My thesis currently contains two branches building on one another. The first branch encompasses my research, writing, and investigation into the realm of sustainability while the second branch consists of visual studies and analyses of the data I am unearth. The question that guides my visual studies is “what does sustainable graphic design look like?” My visual studies take the form of several broadsides investigating how design influences message, different ways that statistics can be digested, filtered and shown, and examining what current green-myths exist. The works themselves are simple and conceptual which makes them easily installable in a gallery setting. 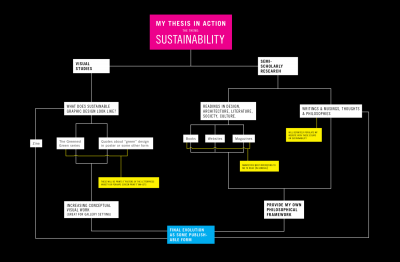 My research investigates sustainability as a whole, in design, in the real world, as a philosophy. The form this has taken is of reading and reflecting, examining existing frameworks, ideals, and structures, and then deciding for myself what works and what could be better. The outcome of this branch will be my own framework, a framework that will allow me to create work that intrinsically captures what I find sustainability to mean. These branches initially lead down different paths of study, reach a maximum point in differentiation, and then begin to lead back towards one another. The framework text I have developed will provide contextual information for the display of the visuals. The final product feeds back into itself to become some sort of publishable form (medium not yet decided, thought this website will be part of it).